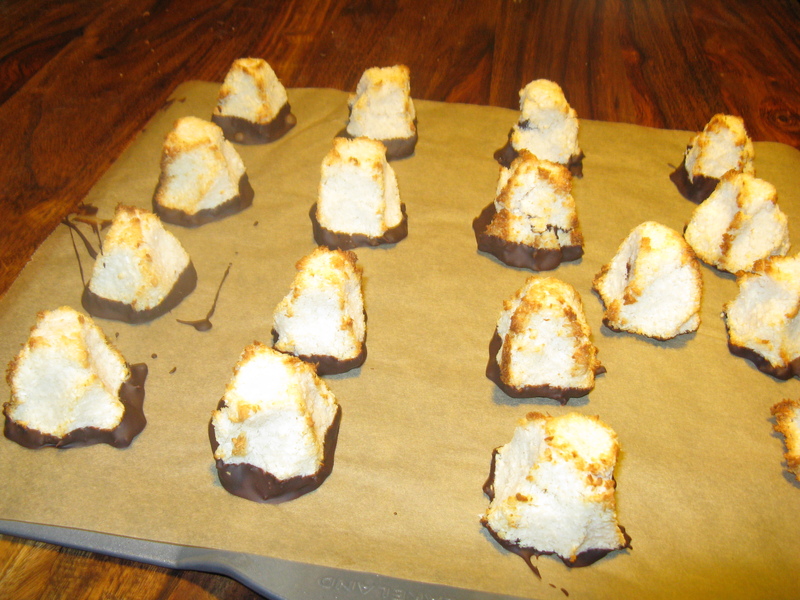 Bounty bars are all very well, but the brown edges you get on a homemade coconut macaroon wins every time! Which is exactly what I baked this week for my work colleagues. The recipe is based on a Cooks Illustrated recipe (subscription required), but I couldn’t find shredded coconut or corn syrup, so I just used more desiccated coconut and finished up a bottle of maple syrup. Basically everything except the chocolate goes in the mixer and gets mixed together. 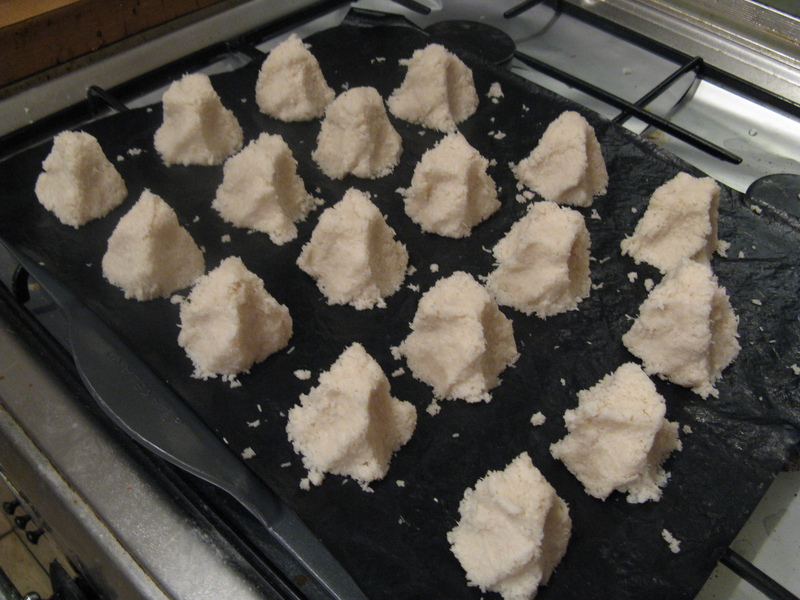 This gets chilled for 15minutes before being put on a lined baking tray and shaped into… erm… pyramids with a flat top I guess. Make sure they have refined edges as these colour nicely. These get backed for 16 minutes, turning half way through. They should be nicely crisped up and brown on the edges. Transfer to a cooling rack to fully cool. Melt and temper the chocolate so it’ll be nice and crisp when it sets (microwave 2/3 of it until it melts, then melt the rest of the chocolate into it while stirring, then give it a final 30s blast in the microwave before using — I did’t bother with the IR thermometer this time). 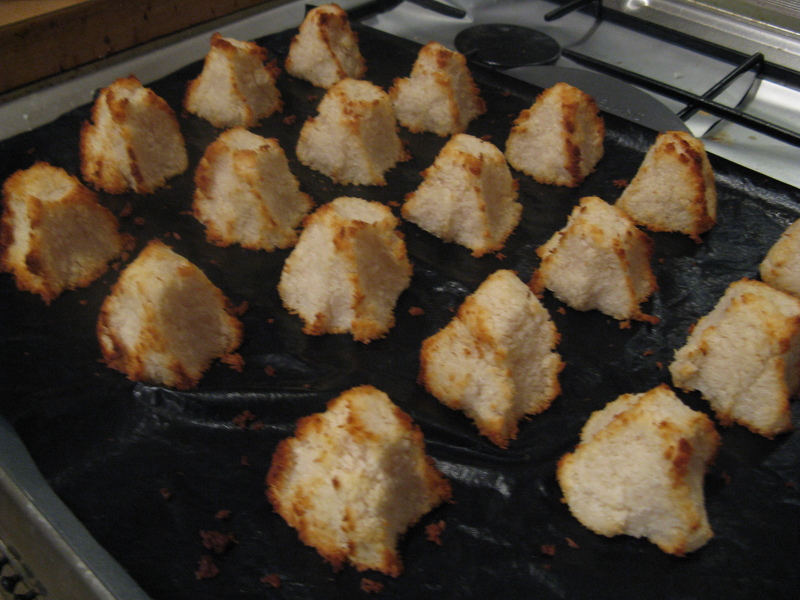 Carefully dip each macaroon in the chocolate, transfer to a lined baking tray, and pop in the fridge to set. I was, however, very happy with the tempered chocolate. Although I must write down the temperatures I need to know so I don’t have to worry about trying to find them in the future. Finally I wasn’t so good with measuring the chocolate out. Some of the early ones had a deep thick covering, while later ones just had a thin spread on the base.